Let’s build a DIY side table. Here are 19 easy to follow project ideas that you can build on a budget and fast. A side table has many uses in the house and even outside on your patio. It can be used beside your sofa to keep your drinks and snacks as a coffee table or as an end table; it can be used as a bedside table as a nightstand as well. Essentially, you can use it anywhere you need a small surface inside our outside. Side tables are usually rather small, so they make an easy DIY project. We are sure you can make a unique side table if you get the right instructions. So to help you with that, we’ve come up with a list of 19 excellent tutorials for a DIY side table. Check these out! 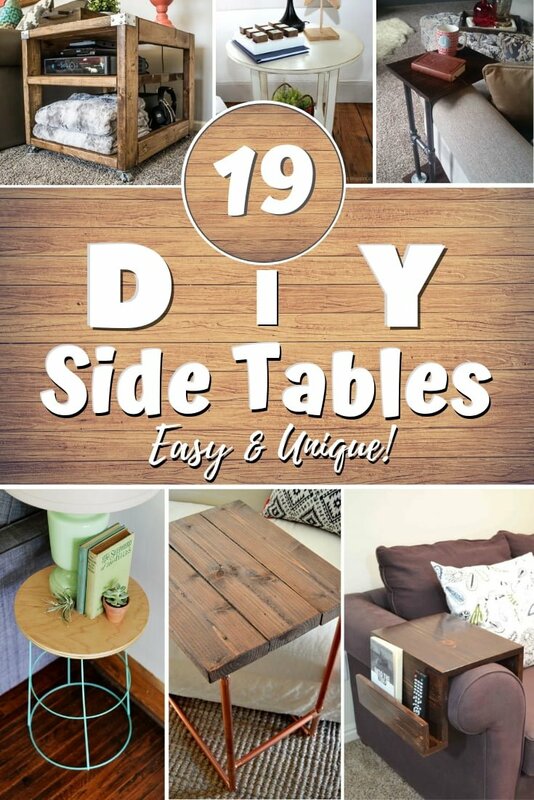 Are you looking to make another type of a DIY table? The “C” Table is a nifty little table that you may find extremely useful if you’re into coffee. Despite being so rudimentary, the table honestly looks good courtesy the harmonious bringing-together of oak wood and metal. If you’d like to learn how to make this table, check out the tutorial for more. Made from reclaimed wood, this farmhouse end table takes you back in time. There is a distinct character to the table, and the board gives the table quite an antique look. There’s not much to the base, intentionally done so to keep the onlooker’s focus on the tabletop. Check the DIY tutorial out to learn how it’s made. This metal pipe laptop table is versatile since it could also be used as a makeshift tray to hold the remote control and snacks when watching TV. Made out of wood and copper, this table is ideal for people who like to work seated on their sofas. To learn how to create one for you, go through the tutorial for instructions. The Habitat fits into any room or ambiance, thanks to its elegant circular design. Making the table is simple – the plan entails only a few steps and requires minimal supplies. Though an ideal table to build for beginners, make sure you’re handling the jigsaw with dexterity since cutting out a perfect circle can be tricky. The tutorial gives out the details on how to make the table. Farmhouse windows can be put to great use, provided you have sandpaper, a drill and paint handy. This DIY farmhouse table, made from an old window, would fit in perfectly in a family room. Thanks to the window-style bottom, you can fit in a basket or plant within that space. Go through the tutorial to learn more. This table is designed to seamlessly lay over the arm of your sofa and provide you a level surface to position your game time snacks and drink. There’s also a small pocket to place the TV remote. Check out the tutorial if you’d like to know how to build this table. This sofa “C” table is a handy table to have if you frequently use your laptop PC while seated on a sofa, or if your kids watch movies sitting on the couch and would not mind having a table by their side to place their snacks. Learn more about the table from the tutorial. 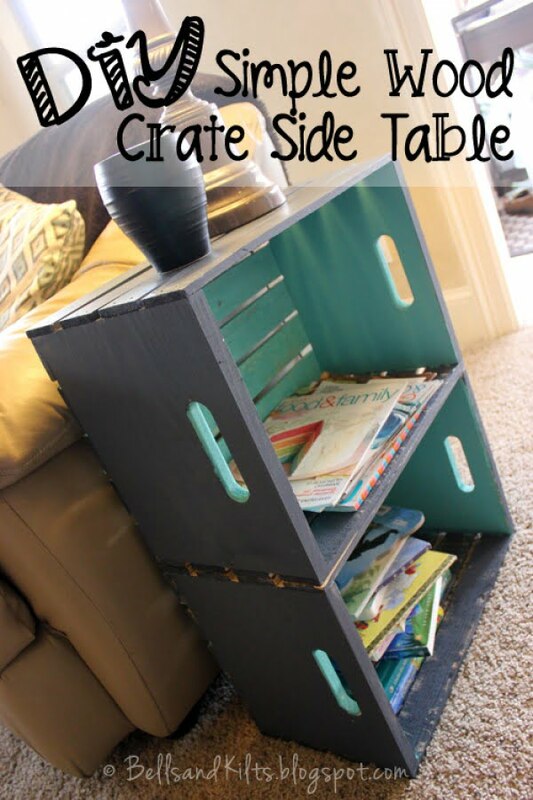 This DIY sofa table is ideal if you have a sectional sofa in your house. The table is a slide-below-the-couch table that has a minimalistic, modern design and doesn’t take too much space. Check out the tutorial for instructions to make the table. This is another sofa side table that goes well with a sectional sofa, but it doesn’t slide under the couch. If your large sofa is not covering up the wall entirely and there is a small portion of the wall exposed, you can fill that space with this sofa. Learn how to make the couch from the tutorial. This simple side table goes well next to a sofa or side chair in your living room. You can have more of these tables in the house, with one also in your bedroom as a nightstand. See the tutorial to learn how to make this budget-friendly table. This end table is ideal if you want something sized just right to place your lamps on. It should not take more than two hours to make this stylish table that also provides some storage space. Check out the tutorial to learn how to make this table. If you are into historical furniture, you’d like this mid-century side table. But do not let its name fool you since it’s aware of modern human needs and therefore comes with a space to house your phone and TV remote. Go through the tutorial to learn more. This tiny, under-the-couch side table serves as a stable platform to place a book or some snacks and coffee. The table is not too small or too big and is also reasonably lightweight. Click the tutorial link to learn how to make this side table. The Ballard Knockoff table is a massive spool. The design is unique and also versatile enough to fit inside a casual environment or a formal setting. Learn how to make this rope-tied table from the tutorial. This table is indeed one-of-a-kind. You’ll only need a thick disc of a tree stump to make this table. The polyurethane coating gives it a subtle sheen, and the beautiful table legs add plenty of their style. You’re going to fall in love with this table. Just follow the simple steps. 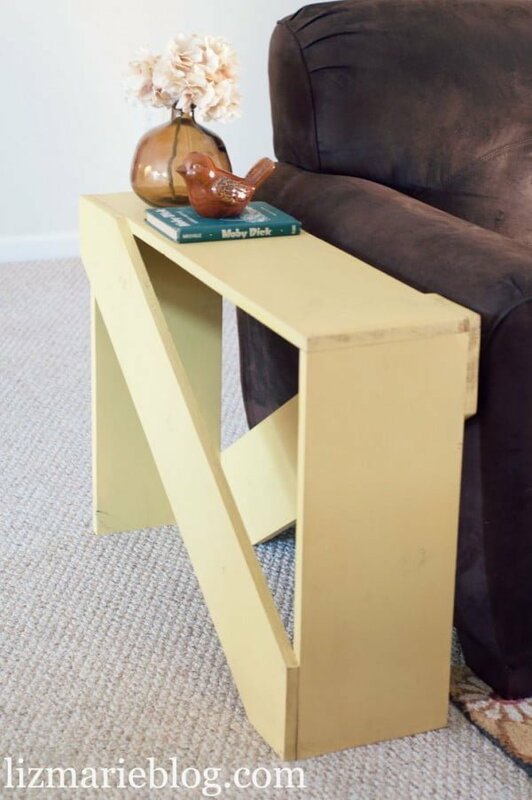 This 5-board end table is straightforward to make, even if you don’t consider yourself to be a handyman (or handywoman). You’ll save a lot of money on a must-have furniture piece. The sofa table used to be a placeholder for the remote or a few choice plants, but it has become a necessity for phone chargers or tablet chargers. There is no need to purchase an expensive sofa table when all you need is a few 2x4s and the patience to make it on your own. This thin whitewash or ivory table should be perfect for you. A small side table can be placed next to a sofa as an extra surface for a table lamp, little things or even to create home decor vignettes. Making a simple side table from crates allows you to add another rustic accent piece to your home decor in a practical way. This side table is designed to look like a crate, and the benefit is two-fold. It looks great and adds to the rustic style, and it’s straightforward to build. It’s so simple that you can easily make two of these side tables for symmetry. Check out the tutorial for step-by-step details on how to create it.